Basically, have a photo for every day, following the suggested subject matter. I'm finding out about this late and instead of posting each day, I'll go once a week. Most of these will be from my current photo albums instead of new ones. I'm going to enjoy looking through them again. looks like this isn't going to happen. 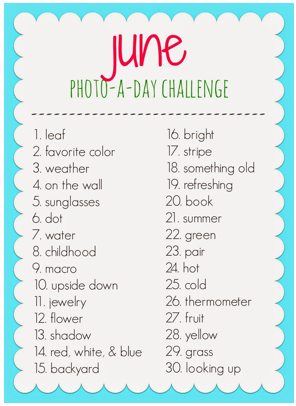 I don't want to do all this work then not be welcome because of other blog content so I'm jumping over to another photo challenge and will post soon!